WordPress 5.0 – What does it have to offer? WordPress is without a doubt one of the most popular blogging platforms come content management systems around. This is largely due to the fact that it is “simple” and easy to use WordPress. We appreciate WordPress just as much as the next person. It is about to get a major “face lift” to help it keep up with the likes of Squarespace and Wix. Lets see what WordPress 5.0 has to offer. WordPress has always been seen as a simple platform for novice users right through to advanced users and developers. There is a massive amount of community support for the software which has also been a driver for its success. There is plenty of cheap themes out there, cheap if not free plugins and so much more. While cheap themes are a great referral source for businesses like Suncoast Web Solutions there is one thing people love about them. They mostly come with a WYSIWYG editor that is “user friendly”. These editors are a great way for users to change page layouts without much issue or thought. Besides being built on React it takes advantage of a lot of modern technologies like Rest API’s, WebPack, JSX and many more. These same technologies are used by companies of all shapes and sizes globally. Rest API’s are used to send and pull data to and from your website. One thing that will change is it requires developers to think about how they build websites. This is because Gutenberg uses a block system to help build a page. This system enables users and developers to create flexible layouts for websites without developers doing all of the heavy lifting. By heavy lifting we mean coding. Each block will treat content (text and media) as components which are strung together to form a page. This means the traditional method of plan text, media and shortcodes, which developers love and users hate will no longer be used. A great feature that will appear is that the editor offers users the ability to drag and drop content where they like. There is currently one downfall with this new editor… ITS SLOW!!!! A few benchmarks showed page loads were almost 100 milliseconds slower. This doesn’t seem like much but it doesn’t stop there. At this point in time Gutenberg’s dev team are pushing out updates to speed up the editor regularly. In saying that, people have demonstrated clearly with screen captures that it gets a lag in it when editing content for short periods of time. It will improve but it is soomething to be mindful of. What else is happening in WordPress 5.0? 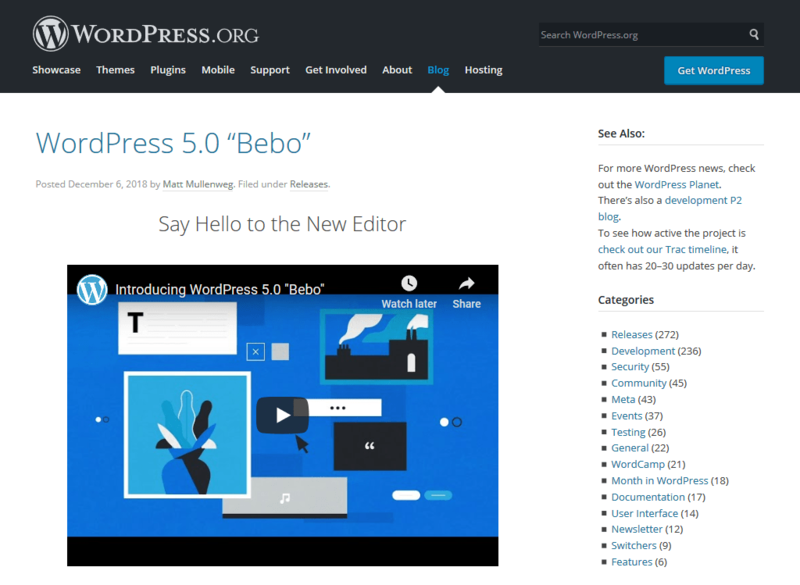 A new theme is what is going to happen in WordPress 5.0. That may not sound all that great but it is conveinently called “Twenty Nineteen” and it of course is built to work with Gutenberg. The combination is interesting to say the least. It will allow users to create entire websites from within the editor. It is also claimed to be a site builder, which is different to being a simple content builder. We could certainly go on for a long time about the new theme as it is impressive and ticks a lot of boxes from a design standpoint. It is also said to make development easier for those who are not so experienced at hand coding themes. The next major change is going to be development cycle changes and release cycles. WordPress have indicated that they will be moving away from its current system of scheduled releases. They are going to ditch the 2 major releases per year and a gazillion small releases to a scope, build and deploy method. There isn’t a clear indication as to what that means to development cycles or bug fixes but it shows progression. Like everything new there are a lot of people recommending that you wait for a few subversions to be released before updating. This is usually smart practice for large sites and production/live sites. It is going to be more by necessity that you upgrade right away. There is going to be a lot of plugins that will not work initially with Gutenberg. It would be safe to assume that most major vendors will be working on, if they haven’t already, releasing compatible versions. You cannot go back to older versions of WordPress after upgrading to V5.0. It may break some themes regardless of who built them. It will certainly replace everything with blocks, this includes widgets and plugins. Finally, our last pitfall, it is going to have many bugs in it but they will get fixed quickly. We will see a major change in direction and thoughts around mobile optimization. The moto has been “Mobile First” for quite sometime but they have shown this with the new Twenty Nineteen theme. It is lightweight, it performs well and more importantly it is very responsive across many smartphones and tablets. The biggest pro for Suncoast Web Solutions customers is we will be able to build Gutenberg compatible themes very soon. We are currently training our development team to build from scratch custom themes that our designers have made. We envisage that we will be building WordPress 5.0 websites within the first quarter of 2019. Further to that we are working on how we can upgrade existing custom themes to work on WordPress 5.0 with Gutenberg as well. How can Suncoast Web Solutions help? We have an experienced team of WordPress developers and designers who can answer most questions about WordPress. If you would like to get your website running on WordPress 5.0 or to build a new website in WordPress, contact our team today.